The skies have been gray and the drizzle and rain have been falling for what seems like forever. 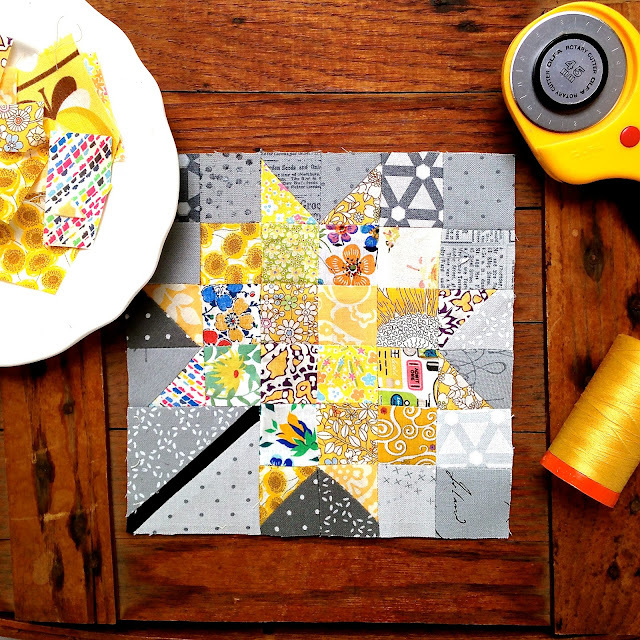 It has been nice to be playing with my yellow scraps with Susan this week on Instagram (gogokim) using up my scraps ( I am beginning tot think this goal is impossible) in fun quilt blocks and sharing to hopefully give some inspiration to everyone in ways to help you get through your scraps too! This is my second yellow quilt block for this week. A lovely yellow Maple Leaf quilt block. I made this self drafted 6in finished Maple Leaf quilt block using Liberty of London scraps for the yellows, the background fabrics are Modern Background by Zen Chic for Moda Fabrics. I pieced this block using Aurifil 50wt thread. The 50wt melts into the light and thin lawn fabric. It is perfection. I am also still playing along with #memademay. I have more handmade clothes than I originally thought! It encourages me to make more! After just a week of looking through what I have and what so many other very talented people are making, I am super excited to find new garment pattern to try! This one is a Burda Style pattern #118B. It is the first Burda pattern I made. Not being a seamstress, the instructions were kinda baffling to me. I am not a huge pattern reader, I am a more of a show me what to do kinda girl :o) The seam allowances are not added in for these patterns. Adding in seam allowances is not a particularly fun process. I cannot say I would recommend it to anyone. I chose a mid weight fabric with lots of lovely spandex. It keeps everything in place and hugs while still fining me room to breathe! I chose Aurifil 40wt for construction of the skirt. I have to to test the 28wt on my serger, I am curious of anyone else has with success. Most of all it was my first successful piece of ME made clothing. If you are doubting your abilities in sewing anything ( home dec, apparel, quilts, bags...), stop! Find a project you love, start with something simple and go for it! 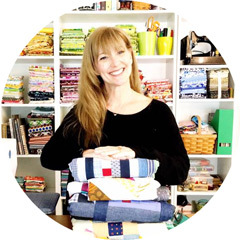 Find a local friend that sews or go online and join a sewing forum. Start looking through youtube videos or find one on crafts from a designer you know and respect.